The Ribblehead Viaduct in the Yorkshire Dales. The images captured on a Panasonic Lumix GX1 with an Olympus 9-18mm lens. The images were merged to create the panoramic in Photoshop and converted to B&W using Nik Silver Efex Pro 2. Yes you read the title of the blog correctly; there is a weakness with my GX1 and no doubt other Micro 4/3 cameras also. Take a look at the image above to see if you can spot it. 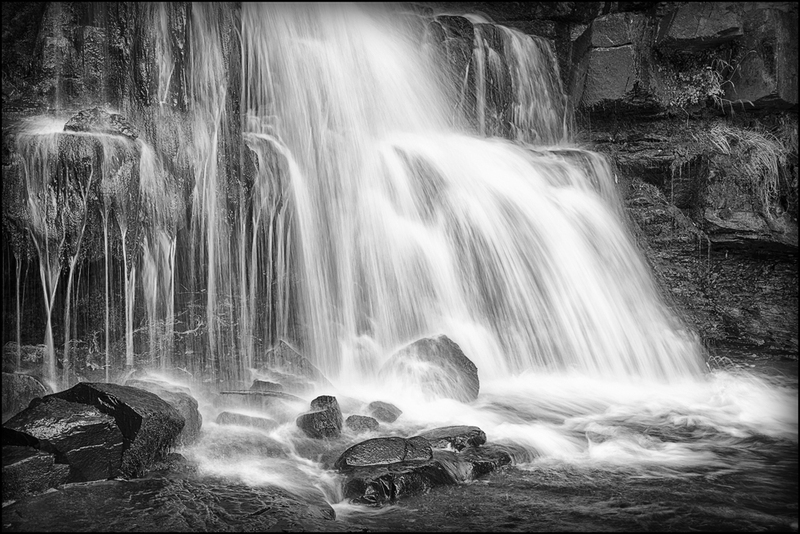 I shot this yesterday in the Yorkshire Dales when out photographing waterfalls with a friend. The intention was to visit a few locations starting at Keld which has loads of falls and then work our way south visiting other falls on route. This is one of the best shots of the day with my GX1. Now the eagle eyed amongst you will have noticed this photograph is not of a Waterfall and that’s because of the weakness I mentioned. I simply couldn’t slow the shutter speed sufficiently to emphasise the movement in the images. Let’s discuss an example. There was quite a lot of water coming over the falls as it has been wet recently (I’m sure those of you based in the UK will know what I mean) so the speed of the water was quite fast. This is good news for me as it means the shutter speeds are not quite as slow as you might otherwise need. I still however needed to slow the camera down to between 0.3 and 0.8 seconds to create the desired effect. The base ISO on the GX1 is 160 and there is no way (at least that I can find) to expand this down to perhaps 80 or even 50 (I hope Panasonic are listening because I’m sure they could do this with a firmware upgrade). At the same time I want to shoot with my lenses in their optimal range for sharpness of f/5.6 to f/7.1. When trying to do this however I was finding that even in relatively shaded areas I was just freezing the water. I did try closing my aperture down to f/13.0 with a couple of ND filters on the front of the lens whilst holding a polarizer in front and it worked to some degree. It still wasn’t great and there was a reflection on the polariser that can be seen on some images. My 5D MKII on the other hand was set to ISO50 with a lens at f/14.0 and a polarizing filter attached. This was giving me nice long exposures that I could control. Here is an example of one of the shots so at least you can see how nice the locations were. One of the many waterfalls near to Keld in the Yorkshire Dales. This image was captured on my Canon 5D MKII. It is a single RAW file which was processed in Lightroom and then converted to B&W using Nik Silver Efex Pro 2. I think therefore that I need to add a further accessory to the list of essentials for this camera and that is a variable ND screw in filter. Oh, and if you are wondering what the image at the top of the blog is, it’s the Ribblehead Viaduct which carries the rail line. GREAT information — thanks for the write up ! Thanks. It’s great to know you liked it. The waterfall shot is great. Some really good advices on the page. Thanks. Its always good to hear people find the blogs helpful. I have now bought a 4 stop ND filter but have yet to try it. In theory it should be enough to bring the shutter speeds down. Its the screw in type so i could always put the dark part of a 3stop ND grad over the lens as well. Would a 10 stop be far to high? Were the ones you tried originally 1 stop NDs? A 10 stop is likely to be too much but it depends on what you are photographing and the look you are after. I was shooting waterfalls and needed a shutter speed of 0.5 to 3 seconds for the best effect. Thats why a 4 stop would have been ideal under the conditions at the time. A 10 stop would have given too long an exposure and lost all detail in the water. I just recently took my GH2, and OM-D out to try to take some moving water pictures. Like you I found very quick that this was not easy! I ended up using two ND filters and the OM-D with its 200 ISO and the GH2 with its 160 were just way to fast for middle of the day pictures. Like I said two ND filters helped a lot but that was not ideal. I would love to see 50 ISO on these camera’s. Yes, I would also like to see ISO50 or at the very least a built in ND filter. Since I posted this blog I have purchased a 4 stop ND filter (Hoya screw in) and it works a treat with the GX1. I still need to stop down at timed but at least the shutter speeds are nearer to what you need for moving water. I had a 3 stop filter that was not enough for the daylight I was shooting in, however I just picked up a 9 stop Hoya ND. I enjoy your blog and enjoyed this post! Thanks. I’m pleased you like my blog. Let me know how the 9 stop goes. I have a 10 stop but find it a little too extreme for most of my work.